Enter what you would like engraved up to 25 Total Max Characters, Spaces, Commas, Symbols, Numbers, or other. If you want a symbol like Heart or Cross, you'll need to message me to add that. CASUAL YET MODERN!!! If you are trying not to break the bank but don’t want a cheap, arcade-looking band for your wedding day, Patriot Coin Rings which is owned and operated by US Military Disabled Vets who do this for others where the proceeds are donated to the Wounded Warrior Project to help those worse off than ourselves is the place to find what you are looking for. We only make high quality, classy and stylish custom bands and if you can't find what you are looking for in our store here just let me know because I custom make bands to order according to your specs! I probably make one unique custom made band every single day for my clients so don't hesitate to ask if you can't find what you are looking for. Back to this ring, this was designed for a client who works in the construction field, wanted something as scratch and ding resistant as possible yet had a modern stylish look. I was asked for something that would be water resistant, wouldn't stain from sweat, scratch resistant, ding resistant and while having a traditional mans look to it the spouse ordering it requested a design be inlaid in the middle to make it stand out with a more fashionable look than a band alone and according to the couple who custom ordered the ring, "WE NAILED IT!!!!!!!!!!!!!" I'm shamelessly wearing one myself I loved it so much. No cheap quality look here! The custom ring which was made according to our customers specs for $399.95 which in itself is a steal in itself is being offered for a limited time at a lower price to pickup a few nice reviews here on ETSY before we bring the price back up again. 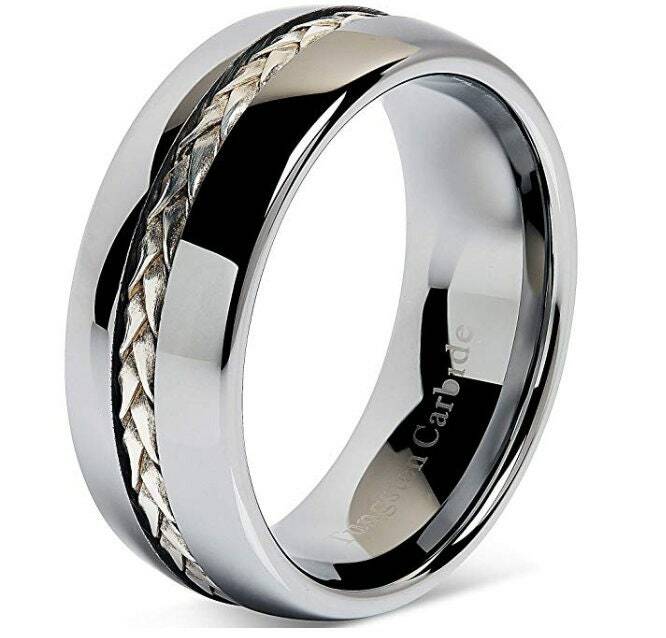 ▶ WATER & SCRATCH RESISTANT: Tungsten ring with Silver Rope Inlay is scratch resistant & waterproof. Resists staining by sweat, acid rain and saltwater so wearing it in the shower, pool or ocean is fine. ▶ MULTI USE: Silver Rope Inlay band for him or her to use as original band or travel replacement ring. Also wonderful as a anniversary ring, wedding band replacement for lost wedding bands, etc. ▶ SUPPORT A VET: All purchases made through Patriot Coin Rings helps our disabled vets! Questions? Contact me through Etsy and I'll reply within 24 hours! OVERSTOCK US SIZE 10 - 8mm Tan/Black Tungsten Carbide Ring Camouflage Hunting Domed Comfort Fit Perfect for Fathers Day or Birthday! 8mm Tan/Black Tungsten Carbide Ring Camouflage Hunting Domed Comfort Fit Perfect for Promise, Wedding, Engagement, Anniversary or Birthday!